Car owners were extremely helpful and great to communicate with. The VAN was the right choice for us - 2 adults + an infant. It is an older VAN but running just fine! It was well equipped, perfectly served the purpose of travelling, sleeping and cooking!!! Piotr and Joanna were excellent great. We had 3 adults and the van was a little small for us to fit. They tried to help us find a bigger one, but we managed to make this one work. The van was older, but very well maintained and ran perfectly. We slept comfortably and kept warm on windy cool nights. I would suggest it is a better choice for 2 people than 3, but overall we had a great experience. Thanks again to Piotr and Joanna. It's a very good diesel car in a very reasonable price. 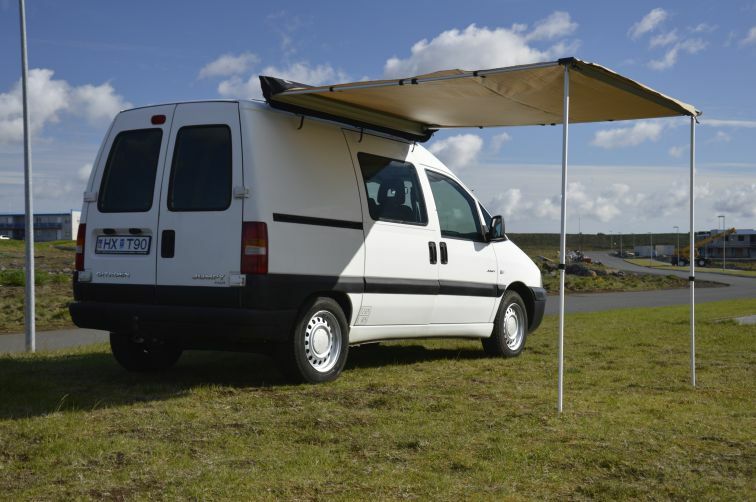 The camper is agile and at the same time spatious enough for camping (sleeping, cooking). We did the RIng road with many detours having no problems with the car. Heating and the fridge work fine. The camper was very practical, consumed little fuel and was easy to drive. We cooked a lot so we appreciated the cooler (gaz and electric) and the little gaz stove. The cooking equipment was well planed. The extra space provided by the tent (easy to install) and the chemical toilet were practical as well. We had a bed that covered the entire whith of the camper so we could stretch. Two things to ajust : second gaz burner and water pump. This van is really confortable and equipped. The fridge, the heating system, the sink, the gas burner, etc... make it super functional. And the owners are helpful and very easy to contact. Don't hesitate to rent this van !